Discuss the Human Resource Management for Woolworths Limited. HRM practice is referred to as the governance of employees of an organization that is responsible to create and implement the behavior of employees. The goal of HRMhttps://thebestassignmenthelp.com/ team is to balance the assets in a well-organized manner. Due to certain management oriented problems the organization faced massive loss in the competitive business market; those HRM gaps are also going to be analyzed in this paper. In order to mitigate these gaps from the overall analysis, a conceptual model has been developed. 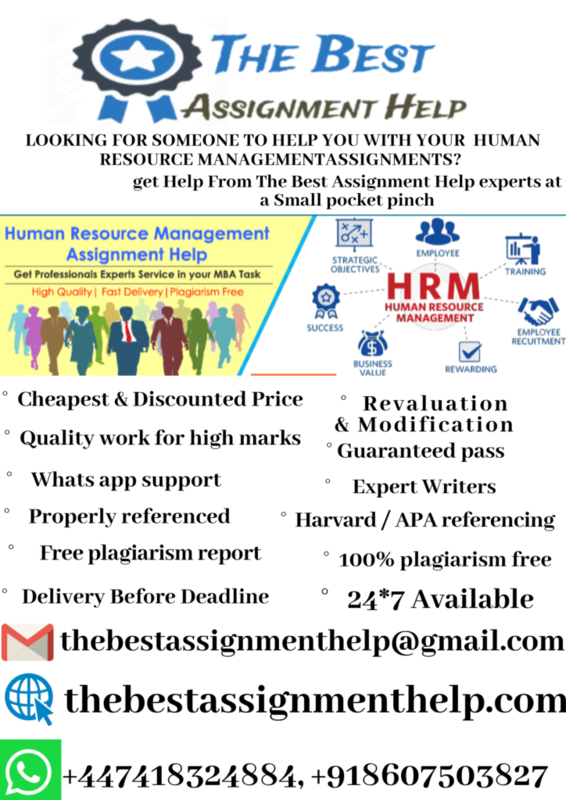 The literature review firmly focuses on the best of Human Resource Management Practices that are perceived to be applicable by a different organization. Here the best HRM practices maintained in an organization namely a WOOLWORTHS LIMITED are discussed. The norms and regulations of HRM practices are different in every organization. These will demonstrate different HRM business models and theories. The conceptual model of the Key factors of theories is also illustrated in this literature review. Structure development and business case development: Most of the known companies are evaluating these HR practices in order to develop the performance of the team as well as of the organization. Fan, Zhang, and Zhu, (2013) stated that business development is completely or somewhere partially dependent on the structure of the HR model. On the other hand, said that the impact of HR opportunity in structured governance and business case development, the level of efficiency is about 39%. At the same time, HR functionalities and the measurement of strategic people are interrelated to each other. Thus, from the discussion, it can be concluded that the development of the HR structure leads the organization to massive growth. Development of workforce planning capabilities: workforce planning is another vital approach that is defined in the field of HR practices. If the advanced approaches are not developed then, it will move the organization to competitive loss (Ali, 2012). From different approaches an argumentative outcome comes out that is, there is a major pitfall which is closely related to HR functions. At the same time, HR functions play the most important role in the management of the entire organization. According to Howard, (2013) proper training and development programs are incorporated into the known organizations as these help the organization to plan for the capabilities. Development of appropriate HR philosophies: Klikauer, (2012) stated that the strategies planned for the HR management team of an organization must have appropriate philosophies regarding the workforce of the organization. In order to develop an organization, massive and dynamic changes are needed to be incorporated by HR practices. An organization has some of the best HR practices but recently the number of employee disengagement is increasing in a rapid manner. Lloyd-Smith, (2013) opined that HR teams concentrate on the working environment of the employee. Jamali, El Dirani and Harwood, (2015) stated that the most effective philosophy regarding HR management firmly focuses on innovation and creation in the workplace. Thus, it can be concluded that this strategic implementation is vital from the organizational aspect. Flexible HR design: It takes around 20% of the total efficiency regarding HR practices in organizational development (Thite, Wilkinson & Shah, 2012). HR success model is also referred to as a predictor and it allows several adaptive movements in the ground level of the organizational HR management. Mitchell, Obeidat and Bray, (2013) stated that all the HR staffs are capable to adopt the features of the models. Thus, from the argues it can be concluded that the HR design should be modeled in such as way that all the staffs including the management level employees should be able to access the flexible model (Parry & Tyson, 2013). the building of a perfect project plan regarding HRM is very crucial as the HR team of the organization is not enough efficient in their application fields (Rouditser & McKeown, 2015). The employment management team basically helps to increase knowledge management capabilities by analyzing different key factors. Development of HR skills: According to Price, Bailey, and Pyman, (2014), the skills of the HR management team are the most important thing to develop the performance of the organization. Not only this but also a training and development program should be incorporated for the HR management team of an organization as the most important role is played by the HR team (Mertens et al., 2016). While developing the project for an organization, human resource management team, the attributes will collaboratively make the possible and successful outcome of the company (Rangoato, 2013). The factors of the HRM team of an organization provide different options to the company and its consumers. Thus, proper management is very important. Improvement in line management capabilities: In order to develop the management capabilities all the employees working under the management team must be capable to do their job role in a proper way. An organization should improve their decision making power in terms of focused relation along with the employees and with the consumers of the company. Improvement of the capabilities of the manager: the manager of the organization should have to capable of their job role so that they can take an appropriate decision for the benefit of the company. The manager is an asset of the HRM team, therefore; the decisions should involve the requirements of the employees also. Outsourcing HR strategies: In order to enable the internal teams to focus on a particular set of factors outsourcing of strategic goals are important to be adopted by different organizations. Improvements in the outsourcing areas are possible by developing an economic scale, global coordination and rapid HRM growth. Measurement of HR operations and business metrics: In order to ensure the efficiency and business alignments an organization should focus on the HR operations and business strategies. These strategies implement strategic HR functionalities and crucial commercial decision making power to the organizations. These approaches provide a secure connection between the HRM and employee’s efforts. Employee facing HR system: An organization should improve their HR system towards employees facing system. It means that, the system should have to be employees friendly in nature. Woolworths Limited is one of the largest and popular retail industries having around 3200 stores throughout Australia and New Zealand (Woolworths limited, 2016). The literature focuses on the HRM of different organization’s functionalities and different ways through which it deals with the supplies quality and inventory management as well. According to Zhang et al., (2015), HRM team plays a paramount role to manage the employment of an organization. Mitchell, Obeidat and Bray, (2013) stated that, as it is a manpower resource center, thus, it focuses on recruitment, selection of right people to set a precise objective for the organization. Sawang and Kivits, (2014) opined that in order to accelerate the dynamic changes in a proper manner HRM team must concentrate on the strategic objectives and the individual employee needs in the workplace. Recruitment and selection: Thite, Wilkinson, and Shah, (2012) stated that managerial styles and organizational culture based on HRM policies, highlights the appropriate structure development and skills measurement of every individual. At the same time, Blackwood & Bentley, (2013) said that a proper person should be recruited for appropriate job profile. It can be concluded that HR practices need more attention to develop and maintain the competencies and behavior of every individual those are recruited and selected for the organization. Training and development: According to Jamali, El Dirani and Harwood, (2015) training and development in the organizational level outcomes always different in terms of functions and those can be identified as HR outcome, Overall performance outcome, financial outcome, changes in share market. Again, Mitchell, Obeidat and Bray, (2013) opined that HRM practices are used to develop firm-specific competencies to create organizational knowledge for sustainable competitive advantages. From both the statements it can be concluded that the HRM practices in contemporary organizations should implement training and development programs. Klikauer, (2012) stated that the strategies planned for the HR management team of an organization must have appropriate philosophies regarding the workforce of the organization. In order to develop an organization, massive progression in employees carrier and dynamic changes are needed to be incorporated by the HR practices. Woolworth Limited organization has some of the best HR practices but recently the number of employee disengagement is increasing in a rapid manner. Lloyd-Smith, (2013) opined that HR teams concentrate on the working environment of the employee. Pay and benefit: Thite, Wilkinson, and Shah, (2012) stated that, key contents of the HRM approaches are designed and managed in such a way that, control all the necessities of an organization from economical context. Parry and Tyson, (2013) opined that executive pay and remuneration depending on the performance of every individual provides necessary benefit to the organization. Thus, it is concluded that motivation including reward functions are needed to be incorporated to accomplish the HRM practices of the organization. Performance appraisal and feedback: Blackwood and Bentley, (2013) opined that HRM team motivates the employees for their positive performance. In addition to this, Rouditser and McKeown, (2015) stated that the organization which engages efficient staffs for higher performance should provide appraisal as per HRM norms. Therefore, it can be concluded that the requirements to redefine the HR strategies and practices are essential to enhance the performance of the organization. Labour relation: According to Sawang and Kivits, (2014) open communication is the most efficient thing to maintain the relationship among the HR management team and the employees working for an organization. Again, Mitchell, Obeidat and Bray, (2013) argued that massive involvement in HR practices put positive impact on the organizational performance. Thus, it can be concluded that positive labor relationship maintenance is important to improve organizational performance. Jamali, El Dirani and Harwood, (2015) stated that the most effective philosophy regarding HR management firmly focuses on innovation and creation in the workplace. Thus, it can be concluded that this strategic implementation is vital from the organizational aspect. FY14, the measurable objectives: From a survey report it is found that most of the organizations are strictly committed to the regular review and updates of the measurable objectives in order to ensure the continuous enhancement in the diversity profile that can support their business strategies. In the development of organizational strategies classical approach is the most efficient approach (Jamali, El Dirani & Harwood, 2015). Most of the well-known organizations follow the classical organizational model in order to understand the appropriate corporate strategy. The components of the model are as followed: cost leadership, differentiation and focus (Cooke, Wood & Horwitz, 2015). This is another gap defined in WOOLWORTH’S HRM practices. Great man theory: The great man theory is referred to as the inborn leaders and not the made talent (Sawang and Kivits, 2014). In this case, leaders born with a talent and do not gain it from any outsource. Trait theory: The trait theory is referred to as the great man theory but after proving his or her talent. The employees working for the HRM of Woolworths Limited inherits certain unique qualities (Parry and Tyson, 2013). These lead them to behave like a leader of the company. It is capable to identify unique personalities and employee’s characters. It is one of the naturally pleasing theories and it provided constructive data about the leadership. These are all personality traits such as abilities, personal traits, and motivational traits. Behavioral theory: This theory is based on the leadership characters that possesses by some of the employees. In Woolworth, this feature can be obtained while working for the company and it is not is an inborn feature (Thite, Wilkinson and Shah, 2012). A leader leads the other employees and motivates them to give their best for the organizational improvement. Via learning and teaching, one common employee can become a leader. Contingency theory: Contingency theory is referred to as the environment which helps to develop a leader within an organization. The surroundings of the leaders are effective for Woolworths limited (Mitchell, Obeidat and Bray, 2013). The relationship between the leaders and subordinates help to establish effective communication. Situational theory: The level of confidence, respect rust, and influences among the employees are stated as the situational theory (Blackwood & Bentley, 2013). All the employees from the top level managerial team to the lower level management employees working for Woolworths limited are dependent on the situation theory. The Woolworths Company maintains the traits theory and contingency theory in order to develop their overall working structure. The Woolworths organization follows both the Trait Theory and Contingency Theory for their human resource management. The trait theory has its disadvantages as most of the time; the physical characteristics of the leader are taken into consideration like weight, height, etc. The application of the Trait theory is not effective for Woolworths as subjective judgment is bound to it. On the other hand, the application of the Contingency theory is most suitable for Woolworths Limited. The contingency theory allows Woolworths to ensure that the right people are available for the particular project. Through the application of the contingency theory, Woolworths exercise complete control over its employees throughout its all the locations. After analyzing the overall Human Resource Management oriented factors of WOOLWORTHS LIMITED, a developing project plan is provided to the HR management team of the company in order to develop the existing strategic business structure. The existing strategic plan is needed to be analyzing first so that one could able to understand that what are possible changes might add to it. After the addition of certain factors, the developed project plan is found to be efficient enough. The revenue of the company also mentioned in this assignment so that one could be able to understand the previous situation and the current situation of the company. Among all the Australian industries the rate of employee disengagement is found to be less in this organization. Ali, A. (2012). Leadership and its Influence in Organizations–A Review of Intellections. International Journal of Learning and Development, 2(6), 73-85. Blackwood, K., & Bentley, T. (2013). Out of Step? The Efficacy of Trans-Tasman Law to Combat Workplace Bullying. New Zealand Journal of Employment Relations (Online), 38(1), 27. Cooke, F. L., Wood, G., & Horwitz, F. (2015). Multinational firms from emerging economies in Africa: implications for research and practice in human resource management. The International Journal of Human Resource Management, 26(21), 2653-2675. Fan, D., Zhang, M. M., & Zhu, C. J. (2013). International human resource management strategies of Chinese multinationals operating abroad. Asia Pacific Business Review, 19(4), 526-541. Howard, T. (2013). High commitment human resource management and employee wellbeing (Doctoral dissertation, University of Cape Town). Jamali, D. R., El Dirani, A. M., & Harwood, I. A. (2015). Exploring human resource management roles in corporate social responsibility: the CSRâ€HRM coâ€creation model. Business Ethics: A European Review, 24(2), 125-143. Klikauer, T. (2012). The ethics of employment relations and human resource management: Kohlberg’s seven levels of morality. New Zealand Journal of Employment Relations (Online), 37(2), 1. Lloyd-Smith, M. (2013). A discussion on whether Employers should always adopt a High Commitment approach when making employees redundant.Unpublished Paper, 20, 11. Mertens, W., Recker, J., Kummer, T. F., Kohlborn, T., & Viaene, S. (2016). Constructive deviance as a driver for performance in retail. Journal of Retailing and Consumer Services, 30, 193-203. Mitchell, R., Obeidat, S., & Bray, M. (2013). The Effect of Strategic Human Resource Management on Organizational Performance: The Mediating Role of Highâ€Performance Human Resource Practices. Human Resource Management, 52(6), 899-921. Parry, E., & Tyson, S. (2013). Managing People in a Contemporary Context. Routledge. Price, R., Bailey, J., & Pyman, A. (2014). Varieties of collaboration: the case of an Australian retail union. The International Journal of Human Resource Management, 25(6), 748-761. Rangoato, S. J. (2013). Discrimination based on HIV/AIDS status in the workplace (Doctoral dissertation, University of Limpopo). Rouditseráµƒ, D., & McKeown, T. (2015). The rhetoric & realities of HRM evolution in SME growth. Sawang, S., & Kivits, R. A. (2014). Greener workplace: understanding senior management’s adoption decisions through the Theory of Planned Behaviour.Australasian Journal of Environmental Management, 21(1), 22-36. Thite, M., Wilkinson, A., & Shah, D. (2012). Internationalization and HRM strategies across subsidiaries in multinational corporations from emerging economies—A conceptual framework. Journal of World Business, 47(2), 251-258.
van Eeden, D. (2014). The Role of the Chief Human Resources Officer: Perspectives, Challenges, Realities and Experiences. Knowles Publishing. Zhang, M. M., Bartram, T., McNeil, N., & Dowling, P. J. (2015). Towards a Research Agenda on the Sustainable and Socially Responsible Management of Agency Workers Through a Flexicurity Model of HRM. Journal of Business Ethics, 127(3), 513-523.